Over the past month we have received several enquiries from office fit-out companies wanting to utilise StoreWALL’s slatwalls for workshops or their office environments. Visiting several offices recently I took specific notice of desk areas and in particular the partitions used. Some companies utilise standalone partition walls to separate work areas, whilst others had mini partitions as part of the desk setup. 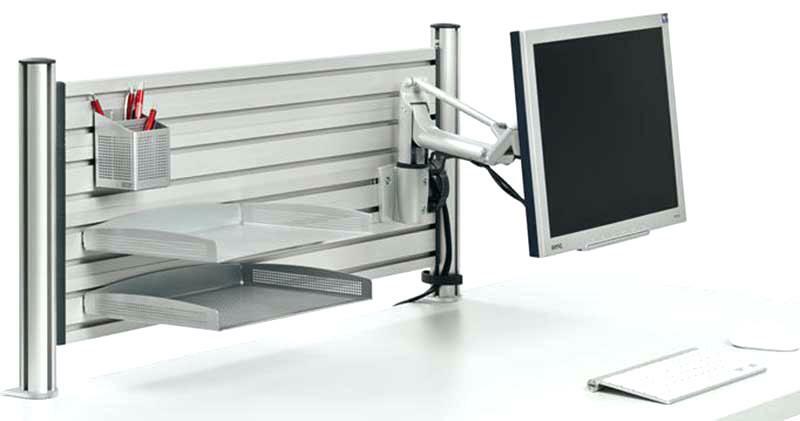 Wall Slats have been a popular option for office desk setups. Notably they can be cut to size and then also allow for a range of accessories to be added. These include large and small shelves as well as boxes and bins. Generally the slatwalls utilise a metallic finish ensuring their durability and ease of cleaning or dusting. For your added convenience, Slatwalls can be cut to size and come in a great range of colours to compliment the office look/feel. Wooden slatwalls can be easily painted. Slatwalls from StoreWALL are made from thermoplastic with the colour built into the material and running through the panel’s depth. Slatwalls in the office offer a very clean and professional finish. See the image to the right as an example. Utilising slatwalls for workshops is also very popular. Consider a mechanic’s workshop or cabinet maker. 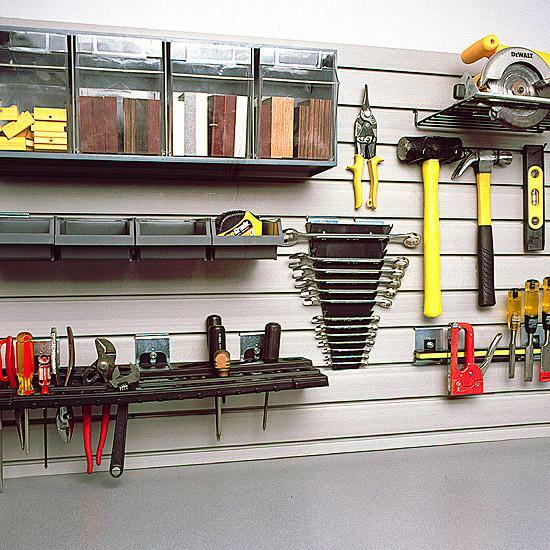 Slatwalls enable the workshop to store important tools in select sections of the wall storage area. Tools are secured and unlikely to cause a hazard nor be damaged. Slatwall accessory options include shelves, hooks, brackets, baskets and bags. These are all great options for the workshop environment. If using StoreWALL’s slatwall panels, it would be worth considering the Heavy Duty range which are larger, thicker and harder. This provides for additional durability in a harsh environment. The hooks can be used for individual screwdrivers or wrenches. Shelves can be used for paints and larger tools. Bins can be used for screws and nails. Baskets can be used for larger items as well as paint and cleaning materials. Options really are endless. You also have the added advantage that should the workshop owner want to move items around, they can do so within seconds. A key requirement when using Slatwalls for workshops is the ability to secure the accessory to the wall. Many cheaper slatwall options are really simple to clip in and just use a small plated hook to secure themselves. What users regularly find however is that excessive on/off movements loosens the accessory and makes it prone to coming off the wall. In an workshop environment the locking mechanism is super important. Tools are a key to a businesses success and also really expensive to replace. Having tools fall of the wall with light or even heavy use is not ideal. StoreWALL offers an exclusive locking mechanism in CamLok which with a twist of the locking key, your accessory will never come loose. You are totally in control when you want to loosen it and move it around. StoreWALL offers CamLok on every single accessory it offers (except the bins). Every hook, shelf, bracket and basket carries this exclusive mechanism. Slatwalls can be painted but this really isn’t long lasting in a high use environment. Slatwalls that have the colour running through the content of the wall are a better option. This ensures that even if dents occur they will be barely visible. Secondly, StoreWALL offers a great range of slatwall colours including our regular weathered grey, Brite White, Dover White, Khaki, Graphite Steel, Rustic Cedar and Global Pine. Garage slatwalls are exactly the same as those used at workshops or the office environment. The only difference is being able to buy in smaller quantities, the durability of the material used to make the slat panels and generally non-commercial pricing.